In 1997, Swatch must have had quite a poor brainstorming session because somehow the idea of a flashing gnome was chosen to welcome website visitors. The website also had an artist in residence, which at the time was Nam June Paik. 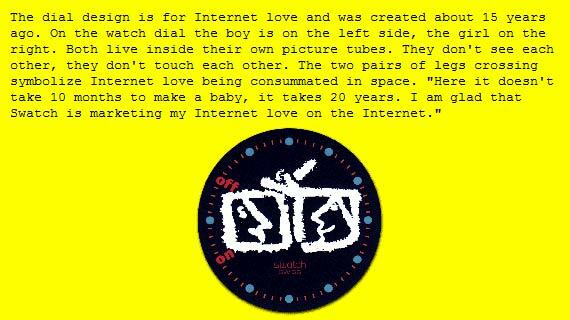 He’d designed a watch which he called “Internet Love”. I’ll think of a sarcastic response to his waffle just as soon as I can translate it into sense. Crikey, I wouldn’t want to go to the toilet at that speed. They should show those at the IMAX. This entry was posted on August 10, 2010 at 11:32 am	and is filed under Swatch. You can follow any responses to this entry through the RSS 2.0 feed. You can leave a response, or trackback from your own site.